Willows provide an extremely rich habitat for insects, especially moths. Moth caterpillars feed on the willow leaves. Some feed on only goat willow, others on willows in general. Some feed on plants from the same family, like aspen or poplar. 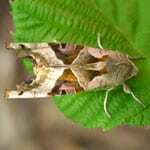 At least 14 moths which feed on willows are fairly common in Northern Ireland, like the Eyed Hawk-Moth (Smerinthus ocellata), Poplar Hawk Moth (Laothoe populi), Puss Moth (Cerura vinula) and Willow Beauty (Peribatodes rhomboidaria). One, which is widespread but very difficult to spot as it is very elusive, is the Lunar Hornet Moth (Sesia bembeciformis), which looks very like a hornet! The leaves are oval, up to 12cm long. They are broader than the leaves of other willows (between 1.5 and 2 times as long as broad). They are a dull, dark-grey green on top and woolly below. The leaf margin is wavy and bluntly toothed. The shortly pointed leaf tip is often curled and there are prominent veins on the underside. At the base of the leaf stalks are a pair of small, ear-shaped ‘stipules’, which soon fall off. 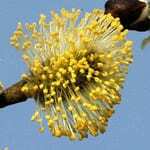 The flowers are arranged in catkins 2-3 cm long. They appear before the leaves on separate male and female trees in March or April. Unlike the catkins of birch or alder, they do not hang downwards, but are upright. Male catkins are oval, grey and furry at first, turning golden yellow later. Female catkins are longer, a silvery green and more slender. Many catkin-bearing trees are wind pollinated. Willows use both the wind and insects – being one of the first sources of pollen and nectar in the spring. 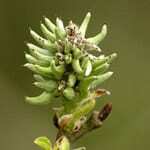 Female catkins turn into the fruits, which are silver green at first, then woolly. Hair on the seeds helps dispersion by the wind. They are produced in huge numbers and have the potential to travel large distances, but only fresh seed will germinate in moist soil, which somewhat limits their distribution. Seeds are ripe in May-June. The bark of goat willow is smooth and grey. 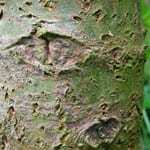 Older trees have cracked bark at the base and brittle branches (which makes them less suitable for basketry). Bark on young twigs is red brown and shiny. The buds are oval and broader compared to other willows. They are yellow with pointed reddish tips. The wood is very soft, the sapwood yellowish-white and the heartwood brown. The timber is not valued much. 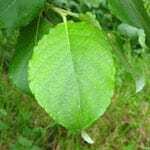 Goat willow is a deciduous shrub or small tree, usually 6-15m tall. It is branched from the bottom with a rounded crown. 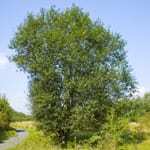 It grows on wet, neutral and lime-rich soils, though it can grow on drier soils than other willows. It can even form part of the understorey in oak woodlands, though it usually prefers open spaces. It won’t tolerate very dry soil.